Blue Jays infielder Mark DeRosa is retiring after a 16-year major league career. ORLANDO, Fla. -- The candidates for the Chicago Cubs radio analyst job are starting to line up after the sudden departure of Keith Moreland from the booth after only three seasons. The Blue Jays have exercised 2014 options on closer Casey Janssen, first baseman Adam Lind and infielder Mark DeRosa and declined an option on infielder Munenori Kawasaki. 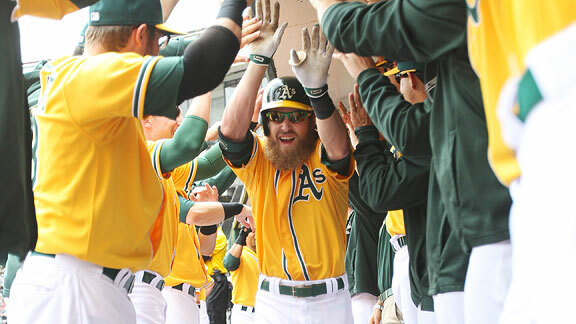 In ESPN The Magazine's Bay Area Issue, Baseball Prospectus' Sam Miller analyzes team chemistry, how it can actually be measured, and how it deserves much of the credit for the Oakland Athletics' surprising success over the past two seasons. Not waiving goodbye to Toronto? Although the trade deadline has passed, there are still chances for deals to be made by either having their players pass through waivers, or having another team claim one of these players on waivers and then coming to some kind of meeting of the minds. Could Braves be looking for deal? If a baseball team lost one of its superstars at this time of the season, nobody would be surprised to see them scrambling to make a deal. However, in Atlanta, the case may be that it's the loss of a a few smaller - but no less important - contributors that pushes them to work some waiver wire deals before the end of August. Brett Lawrie will begin the season on the disabled list, but there was some encouraging news as the Blue Jays third baseman recovers from a rib cage injury. Toronto Blue Jays third baseman Brett Lawrie will start the regular season on the disabled list because of a strained rib. The Washington Nationals has reinstated OF Mark DeRosa from the 15-day disabled list and recalled left-handed pitcher John Lannan, catcher Sandy Leon and outfielder Eury Perez from Triple-A Syracuse.